The sequence of rooms on the left of the atrium of the Casa Buonarroti is used, since 1984, for temporary exhibitions. Until 1990, the exhibition space consisted of three rooms, to which was added in that year a fourth room, recovered by restoring part of the most ancient area of ​​the House, escaped any previous restoration and dating back to the times of Michelangelo. The first three rooms were certainly interested in the interventions to which, in the first half of the seventeenth century, submitted the Palazzo Michelangelo the Younger: it remains a testimony in the nobility of the spaces and especially in the beautiful fresco by Jacopo Vignali – on the ceiling of the first room – depicting Jacob’s dream. 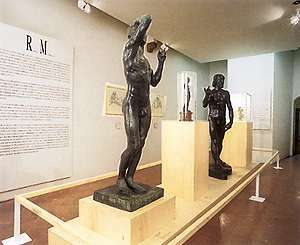 The exhibitions are held annually, on topics related to Michelangelo and the cultural, artistic and memorial heritage of the Casa Buonarroti. The theme is closely related to the institutional aims and the scientific research programs of the House, and it is very vast. In fact, he allowed him to tackle, among other things, some directly Michelangelesque problems (the artist’s youth in the garden of San Marco, or his architectural commitment to San Lorenzo and San Pietro); the myth of Michelangelo in the nineteenth century (from the centenary of 1875 to the evocative comparison with the art of Auguste Rodin); family collecting, through exhibitions that start from the most prestigious pieces of the House (the discovery of the “light painting” deriving from the predella by Giovanni di Francesco; the human and artistic drama of Artemisia Gentileschi, starting from her canvas in “Gallery”).